More often than not, your baby will reach for the strawberries in your dining table among all the fruits and vegetables simply because of the appealing look of the strawberries. It is ranked among the most nutritious fruits and it has a marvelous taste. However, parents usually get into a dilemma when it comes to the feeding strawberries to their babies. There are multiple questions that pop-up in their head. 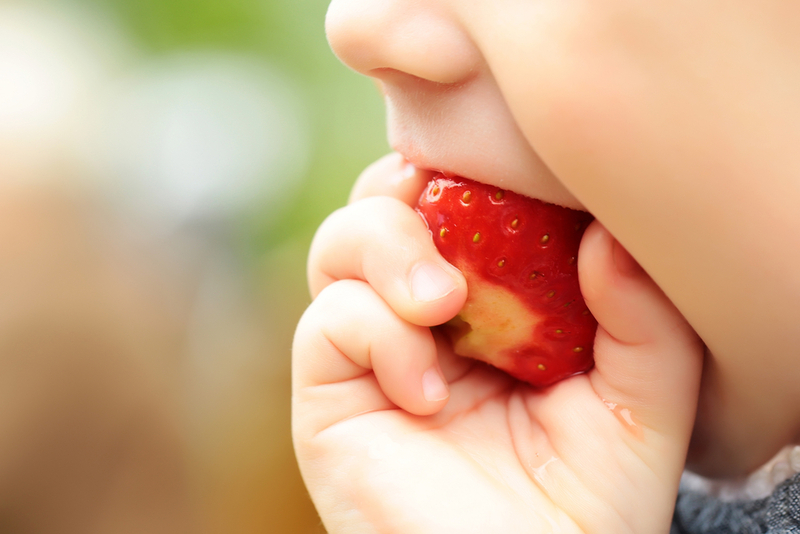 In this article, let’s clear all your doubts about feeding strawberries to your babies. When Can Babies Eat Strawberries? You should be feeding your baby strawberries only after he or she gets at least 1 year old. Strawberries are mostly accused of causing allergic reactions to the babies. But you should know that strawberries are not as allergenic as they are portrayed and it rarely triggers allergic reactions. Moreover, as strawberries produce fantastic health benefits, it becomes a great inclusion in your baby’s diet. Why Many Baby Foods For Stage 2 (Food For Babies Around 6 Months) Contains Strawberry? It is factual that even though you are not supposed to give strawberries for your baby before one year (due to the increased chances of causing food allergy), many Stage 2 foods contain strawberry. This is because the strawberry protein that causes allergy will be destroyed during the baby food processing. At the same time even if we boil strawberries in our home, the heat may not reach the level to destroy the allergens. Therefore homemade strawberry food should be given only after the baby turns one year. Strong Immune System: The phytochemicals, vitamin C, and antioxidants in strawberries work in together in making the immune system of your baby stronger which prevents many diseases. Improved Nervous System: Strawberries have several phytochemicals, which help in improving the nervous system of your baby. Being rich in folic acid or folate, Strawberry enhances the functioning of the brain as well. Great For The Circulatory System: The potassium in strawberries helps in improving the circulatory system with the development of the blood vessels. Keeps Bones Healthy: Strawberry has phosphorus, fluoride, and most importantly, calcium which plays a pivotal role in making your baby’s bones stronger and healthier. Keeping The Baby Hydrated: 100 grams of strawberries provide your baby with 90.25 grams of water which means feeding your baby strawberries will help you to keep him or her hydrated properly. How to Select and Store Strawberries? Nowadays, strawberries are available throughout the year due to the advanced cultivation methods and enhanced pest control methods. However, strawberries also have a huge amount of pesticides in it. Therefore, you need to select strawberries that are produced organically and are bright red in color without any bruises or blemishes. Check the leaves of the strawberry thoroughly because it will give you the indication of the ripeness. Generally, greener leaves and stronger stem will indicate the ripeness of the fruit. Because of so much water content, strawberries could dry out quickly. Therefore, you need to keep them in the refrigerator and consume it within 4 days. While storing strawberries, make sure that the container is perforated in order to avoid the food from getting soggy. By freezing the strawberries, you will be able to keep it fresh for about a week. However, if it gets thawed then do you should not refreeze it. How To Process Strawberries For Babies? Wash the strawberries with a mixture that has three portions of water and one portion of edible vinegar. Now chop the strawberries into four pieces and stem it on a steamer for about 3 to 4 minutes. Finally, blend the strawberries after getting cooled. You can also add water in order to dilute the mixture. Mash the chopped bananas and make sure that they don’t have any lumps. Now mix it with the strawberry puree and blend it in a blender. Dilute the consistency with water or whole cow’s milk (if the baby is at least 1 year old). Puree the ripe mangoes with or without the strawberries. After that, dilute the consistency of the mixture of mango and strawberry with water or whole cow’s milk. Now, the strawberry mango puree is ready to be served to your baby. You should consult your doctor before feeding strawberries to your baby. If there is a family history of asthma or allergies it is important to ask your child’s doctor before introducing this amazing fruit to your baby. Strawberries have a soft and slippery texture. Therefore, babies tend to gulp it before chewing it well. This increases the chances of choking. Therefore, we recommend to cut it into small pieces before giving it to the child. Skin hives with small patches of red or pink rashes. Finally, strawberries do produce allergic reactions to babies and it is always recommended that you consult your doctor before feeding it to your baby. Next Article Is Pregnancy Possible After A Hysterectomy?